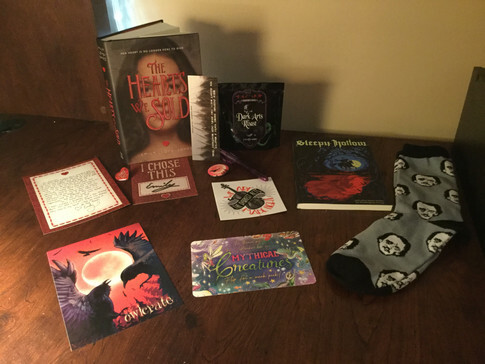 Another Owlcrate has come, this month's theme was Something Wicked This Way Comes and I loved its box! First, we have the pin, which is a raven flying below the moon to show the box's creepy theme. Next, we have a coffee sampler packet that I can't wait to try. It is called The Dark Arts Roast and is inspired by Harry Potter. It has flavor notes of almond, orange, and chocolate, and it is made by Happenstance. We also have a sticker from the Monsters of Verity Duology by Victoria Schwab that says "We are the darkest acts made light". I find these next two items go hand in hand together. The first is the Edgar Allen Poe socks and the second is the inkwell pen, so you can write you horror stories with your classic looking pen and wear socks of a classic author. A Six of Crows bookmark was also included which I'm very excited for because I just got copies Six of Crows and Crooked Kingdom so I can use the bookmark while I read. Lastly, we have a copy of Sleepy Hollow by Washington Irving to go with the creepy theme. Of course, we also have the book which is The Hearts We Sold by Emily Lloyd-Jones which also includes a signed bookplate, a letter from the author, and a pin that says "I chose this". The book is about a girl who sells her heart but then falls in love with someone and is unsure whether it can work out, because can she give her heart away if it isn't hers in the first place? I hadn't heard about this until I received it, but it does sound interesting so I'm excited to read it. We also have the theme reveal and spoiler for next month which is Mythical Creatures and it will include a book sleeve from Book Beau.